Maas started for three seasons at defensive tackle in college and was a first-team All-American choice by The Sporting News in 1982. He was chosen by the Chiefs in the first round of the ’84 NFL draft (fifth overall) and moved into the starting lineup, although he was hobbled by a leg injury late in the season. Maas continued to play very well in the middle of the defensive line. He had a seven-sack season in 1985 and again in ’86, when he was selected to the Pro Bowl for the first of two consecutive years and also received some All-NFL and All-AFC recognition. A knee injury limited Maas to eight games in 1988 and he broke his arm 10 games into the ’89 season, at which point Dan Saleaumua stepped in and excelled. Maas was thus moved to right defensive end in 1990 and adjusted well, garnering 5.5 sacks and four forced fumbles, although he lacked the speed to be a truly effective pass rusher. 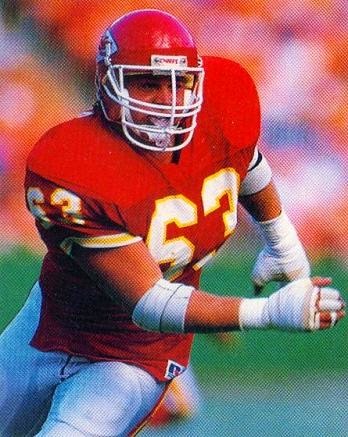 Following an injury-riddled ’92 season, Maas departed the Chiefs for the Packers as a free agent and moved back to nose tackle in what was his last season. Overall, Maas played in 130 games, recorded 40 sacks, returned two of his eight fumble recoveries for touchdowns, and was credited with two safeties.